An astronomical team led by researchers from the Max Planck Institute for Astronomy in Heidelberg (MPIA) has gained new insights into a birthplace of stars. Using the ESA’s Herschel Space Telescope and evaluation techniques more commonly encountered in Hollywood film productions, the researchers produced a three-dimensional map of the dark cloud Barnard 68, a possible future birthplace for a low-mass star. Turning their attention to much more massive dark clouds, the researchers also managed to identify a previously unobserved precursor of young stars. Stars are born when dense clouds of gas and dust collapse under their own gravity. The clouds not only provide the raw material for star formation, they also absorb most of the light emitted in the interior of the cloud. The crucial details of stellar birth are hidden from the astronomers – and they must have one trick or another up their sleeves in order to lift the veil. Now, two groups in the EPoS project led by the Max Planck astronomer Oliver Krause have used the Herschel Space Telescope to look deeper and in more detail into the inside of several dark clouds – and obtained new findings about cosmic births. On the trail of the origin of low-mass stars (less than about twice the mass of our Sun), a team led by Markus Nielbock, also from the Max Planck Institute for Astronomy, has targeted one of the best-known potential stellar birthplaces: the dark cloud Barnard 68 in the Ophiuchus constellation. The astronomers used Herschel’s capability to take images of unrivalled sharpness and sensitivity in the far-infrared light range. They then applied a method more often encountered in visual effects companies creating computer-generated images for Hollywood films than in astronomy. This created the most realistic 3D model of the dark cloud to date. The method, which Ralf Launhardt from the Max Planck Institute for Astronomy has adapted for the particular requirements of the scientists, is known as raytracing. Each light beam that reaches us from Barnard 68 is traced back virtually into the cloud; at each location which the ray passes the program then takes into account whether light is emitted, absorbed or scattered, and the wavelength of the corresponding light. When all the contributions are added up, a three-dimensional cloud model produces the two-dimensional image which astronomers observe from afar. 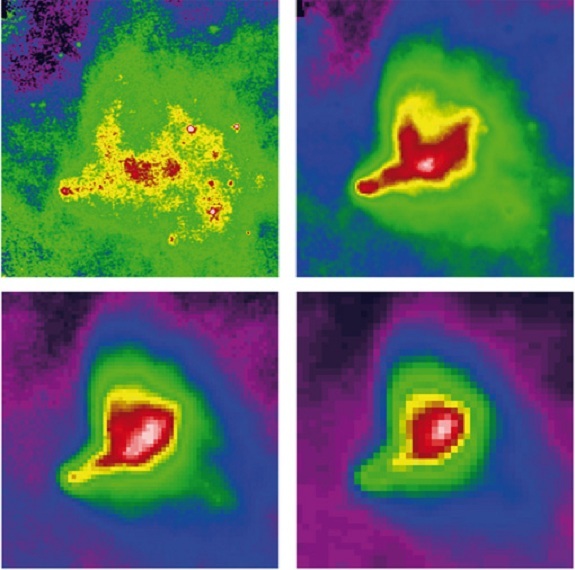 Conversely, the technique can be used to derive a model of the cloud’s three-dimensional structure, such as density and temperature distribution, with the aid of simplifying additional assumptions about the light at different wavelengths arriving from Barnard 68. The results have shaken up some of what astronomers thought they knew about Barnard 68. The emerging picture is one of a cloud probably condensing from a drawn-out filament, heated by unevenly distributed radiation which originates mainly from the direction of the central plane of our home galaxy. The astronomers also found some indicators pointing to a further small cloud colliding with Barnard 68 whose existence had been predicted by an earlier study. The collision might trigger Barnard 68’s collapse, and within the next hundreds of thousands of years one or more low-mass stars could form within it. Compared to other dark clouds, Barnard 68 is rather small. Clouds of this size will give birth to a few low-mass stars at most. To research the formation of massive stars, a team led by Sarah Ragan from the Heidelberg-based Max Planck Institute observed 45 significantly more massive dark clouds. The clouds contain many protostars – star embryos which will form into new suns in time to come. Protostars have already been the target of observation for previous missions, such as NASA’s Hubble Space Observatory. With the PACS camera of the Herschel telescope, the astronomers in Ragan’s group were now able to penetrate significantly deeper into the clouds. They traced the youngest and most primitive protostars known to date. The new observations swelled the ranks of known protostars in the clouds concerned from 330 to almost 500. Most exciting was the discovery of a new type of star precursor: denser regions at a mere 15 degrees above absolute zero (corresponding to -258 degrees Celsius), where no protostar could be detected. These are likely to be the earliest stages of star formation. According to the models, a new protostar is formed in such regions within a timescale of less than 1000 years, which is a very short timescale in astronomy. Investigating these regions should lay the foundations for all further studies on star formation.